If you are suffering from back pain, you are not alone. More than 80% of Americans suffer back pain at some point in their lives. Low back pain, in particular, is very common. The very good news is that it is possible to recover from back pain without depending on medications like prescription pain relievers or muscle relaxers. It is actually possible to improve your function, energy and overall health as you overcome back pain. It is our very great pleasure to work with all kinds and ages of people from not only Media where our office is located, but also Springfield, Newtown Square, Morton, Wallingford, Swarthmore and other nearby communities. We have confidence in the ability of our professionals to restore flexibility and function and relieve the pain of patients because we have seen it hundreds of times. Back pain may be the great curse of our age, as we sit in front of computers all day long, then sit in our cars on the way home and spend evenings sitting even more. When some unusual stress hits a person, like an accident or fall, they may not be able to bounce back to pain-free health without help. And that is where we come in. Why the Combination of Chiropractic, Physical Therapy and Massage? We have seen that the fastest and most complete healing results from combining chiropractic care with physical therapy and massage. When pain strikes and muscles go into spasm, suddenly, your movement is limited. Using chiropractic adjustments, we gently encourage the restoration of the correct position and freedom of your joints – and because your spine has more than one hundred joints, their free movement is essential to your comfort! In addition to chiropractic, we use physical therapy and massage to speed and complete your recovery. Physical therapy helps your body recover the ideal range of motion for each joint. It can also help retrain muscles and ligaments into functionality they lacked before pain began. Massage is a wonderful tool to improve healing. An injured, painful area is tight and toxic. Massage releases toxins and improves flexibility and normal looseness of muscles, relieving painful spasms. There’s one more way this complete system of healing helps you. You get to learn how to maintain your health as you heal from your pain. We will help you understand how to prevent back pain in the future through proper exercise and posture plus stretching that is carefully planned for your situation. 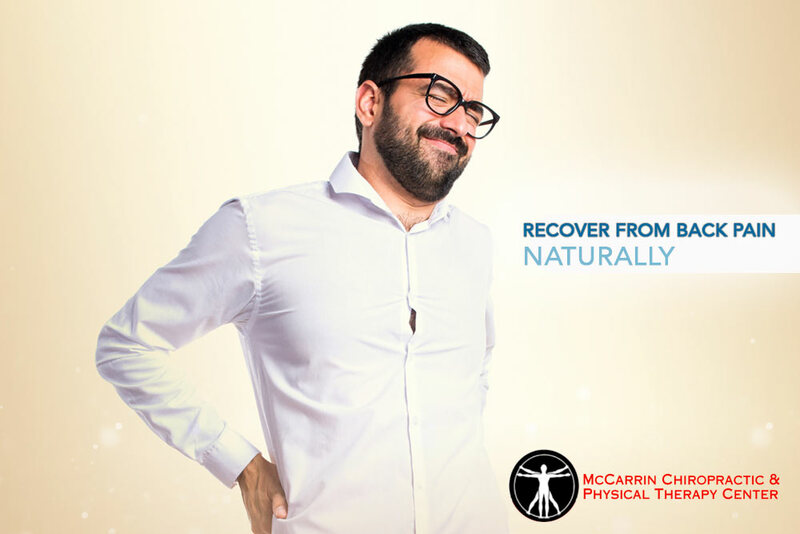 Our goal at McCarrin Chiropractic & Physical Therapy Center is to help you feel better as quickly as possible by returning you to true health. We have accomplished this goal with patients of every age, from children to seniors. If we feel that your situation is better treated with a different type of medicine, we’ll tell you and help you find the right kind of practitioner. And so we can offer our help to the greatest number of people, we accept many kinds of insurance. If you or someone you care about is suffering from back pain, call us today. Let’s find out if our gentle, healing methods can help you.